Disney Christmas ornaments are appreciated equally by kids and parents. If you have a kid, then they're definitely a must. As you have a slew of Disney ornaments to choose from that come in all shapes and sizes, it will definitely be hard to make a decision. Don't worry as we've narrowed down your options for you. 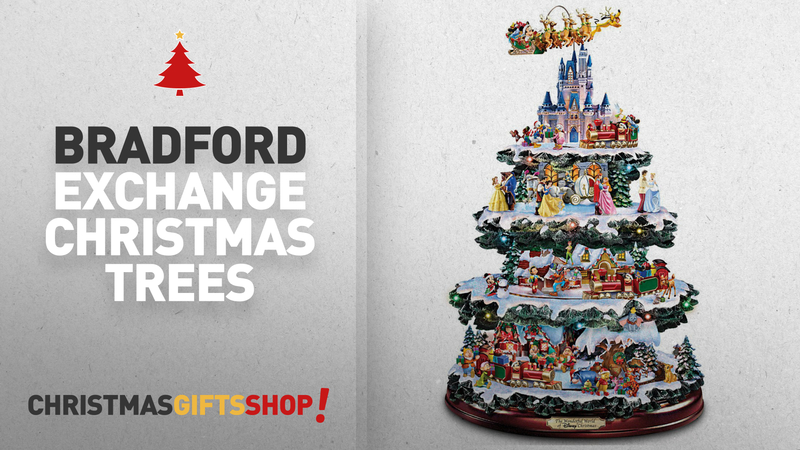 The Disney Tabletop Christmas Tree: The Wonderful World of Disney of Bradford Exchange is first on our list for a very good reason: it allows you to bring Disney magic into a table setting! It's a breathtaking tabletop tree decor that's filled with Disney characters. When we say filled, it's really filled! As a matter of fact, it comes with 10 holiday scenes that star over 50 hand-painted Disney characters from you and your child's favorite movies. As if all those features aren't enough, Bradford Exchange even made it a rotating tree with the figurines coming into life as it's switched on. For the ultimate Christmas decor, you've got to get this one. You'll never have boring Christmas ornaments ever again after you've added these iconic Disney characters into your tree this year. Whether it's for the mini tree in your child's bedroom or the main tree displayed in your living room, this set of Disney characters is sure to garner smiles from onlookers. Yes, from ear to ear! The six characters this set boasts of include Mickey Mouse, 101 Dalmatians, Baloo, Cinderella, Snow White, and Winnie the Pooh. Dress your tree this Christmas with the cutest version of Mickey Mouse holding on to a string of lights for dear life. He's not just looking to spread the holiday cheer, but also trigger laughs from the quirky pose. If you're an avid collector of Disney figurines, you'll adore this take of Aleko of the iconic mouse. In this carefully crafted hanging ornament, Mickey is in a Santa robe and he's wearing white gloves. The entire piece has a clear, shiny enamel finish to catch attention when it's added to your tree. Who doesn't love the famous Pooh Bear with its cute chubby cheeks and fun mini-adventures? If you're still not sure on what to add to your tree as ornaments, then we're sure you've made up your mind now that you've seen this iconic Disney Christmas decoration! It's not just perfect for a child who sees Winnie the Pooh as a role model, but to adults as well as it makes us look back on childhood memories full of joy and silliness! Being one of the latest Disney princesses, this Elsa Ornament is sure to be a hit with your daughter! It's crafted out of porcelain and it’s hand-painted, so it's a realistic picture of the Disney princess. From its material, you know it's made to last. It isn't lightweight to capture the imagination of kids and perfectly represent the Disney character. If you have a daughter, then you definitely have to get this one; it makes Christmas more memorable and exciting for the child! Let's face it! Every single one of us loves Disney and its many characters. We'd be making a big mistake if we don't include this on our list of the best Disney Christmas ornaments. Everyone from Mickey Mouse and Winnie the Pooh to Tinker Bell and Pluto can be found in this revolving tree topper. Yes, it's revolving. Switch it on and the Disney toys will rotate around your Christmas tree. Merry, am I right? This one features the Disney princess from the movie, Tangled. Rapunzel is reading a book with her long blonde hair flowing from her back. If your child loves her, then this ornament won't just be loved this Christmas but for the years to come! Weighing 0.25 lbs, it's a multi-functional product with an ability to sit on your child's aquarium or study table! This Lightning McQueen Christmas ornament is so cute and loved by kids that your children might get more excited about having it in your family's Christmas tree instead of the gifts under it! It comes ready to hang with the ornament's ribbon hanger. With that said, it makes for the best gift to give your child this Christmas. You can even let the kid hang his new collectible up on your tree! Lots of kids love this realistic version of the Frozen character, Olaf. Its smile brings about a childlike joy to each one of us. Even when it's a snowman, it melts you and your kid's hearts as you reminisce how adorable the character was on the movie. As it’s made of polyresin, it can be played by your child and placed back to the tree for display, unlike other Disney Christmas ornaments that are for collectors' only. So, if your little one is a fan of the Disney hit, Frozen, rush before the stocks run out! The last Disney Christmas ornament on our list celebrates the Aladdin movie's release, which was 25 years ago! It plays the Disney movie's official soundtrack, A Whole New World, while both Jasmine and Aladdin fly high above the city of Agrabah (fictional) and the clouds. The package includes an LR44 alkaline battery so your little tot can play the song soon after unboxing!